This article is about the fruit. For other uses, see Guava (disambiguation). Guavas (singular guava, /ˈɡwɑː.və/) are common tropical fruits cultivated and enjoyed in many tropical and subtropical regions. Psidium guajava (common guava, lemon guava) is a small tree in the Myrtle family (Myrtaceae), native to Mexico, Central America, and northern South America. Although related species may also be called guavas, they actually belong to other species or genera, such as the "pineapple guava" Acca sellowiana. 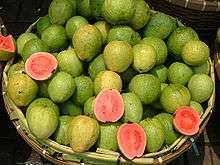 The most frequently eaten species, and the one often simply referred to as "the guava", is the apple guava (Psidium guajava). Guavas are typical Myrtoideae, with tough dark leaves that are opposite, simple, elliptic to ovate and 5–15 centimetres (2.0–5.9 in) long. The flowers are white, with five petals and numerous stamens. The fruits are many-seeded berries. The genera Accara and Acca (formerly Feijoa, pineapple guava) were formerly included in Psidium. The term "guava" appears to derive from Arawak guayabo "guava tree", via the Spanish guayaba. It has been adapted in many European and Asian languages, having a similar form. Another term for guavas is peru, derived from pear. It is common in countries bordering the western Indian Ocean and probably derives from Spanish or Portuguese. In parts of the Indian subcontinent and Middle-East, guava is called amrood, possibly a variant of armoot meaning "pear" in the Arabic and Turkish languages. Guavas originated from an area thought to extend from Mexico or Central America and was distributed throughout tropical America and Caribbean region. They were adopted as a crop in subtropical and tropical Asia, the southern United States (from Tennessee and North Carolina south, as well as the west and Hawaii,) and tropical Africa. Guavas are now cultivated in many tropical and subtropical countries. Several species are grown commercially; apple guava and its cultivars are those most commonly traded internationally. Mature trees of most species are fairly cold-hardy and can survive temperatures slightly colder than 25 °F (−4 °C) for short periods of time, but younger plants will likely freeze to the ground. Guavas were introduced to Florida in the 19th century and are now grown in Florida as far north as Sarasota, Chipley, Waldo and Fort Pierce. However, they are a primary host of the Caribbean fruit fly and must be protected against infestation in areas of Florida where this pest is present. Guavas also grow in a small part of the south of western Europe, specifically the Costa del Sol on Málaga, (Spain) where the guavas are commercially grown since the middle of the 20th century and they proliferate as cultivars. Guavas are of interest to home growers in subtropical areas as one of the few tropical fruits that can grow to fruiting size in pots indoors. When grown from seed, guavas bear fruit as soon as two years and as long as 40 years. Psidium species are used as food plants by the caterpillars of some Lepidoptera, mainly moths like the Ello Sphinx (Erinnyis ello), Eupseudosoma aberrans, E. involutum, and Hypercompe icasia. Mites, like Pronematus pruni and Tydeus munsteri, are known to be crop pests of the apple guava (P. guajava) and perhaps other species. The bacterium Erwinia psidii causes rot diseases of the apple guava. 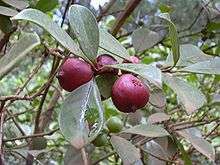 Although the fruit is cultivated and favored by humans, many animals and birds consume it, readily dispersing the seeds in their droppings and, in Hawaii, strawberry guava (P. littorale) has become an aggressive invasive species threatening extinction to more than 100 other plant species. By contrast, several guava species have become rare due to habitat destruction and at least one (Jamaican guava, P. dumetorum), is already extinct. Guava wood is used for meat smoking in Hawaii and is used at barbecue competitions across the United States. In Cuba and Mexico, the leaves are used in barbecues. Guava fruits, usually 4 to 12 centimetres (1.6 to 4.7 in) long, are round or oval depending on the species. They have a pronounced and typical fragrance, similar to lemon rind but less sharp. The outer skin may be rough, often with a bitter taste, or soft and sweet. Varying between species, the skin can be any thickness, is usually green before maturity, but becomes yellow, maroon, or green when ripe. The pulp inside may be sweet or sour and off-white ("white" guavas) to deep pink ("red" guavas). The seeds in the central pulp vary in number and hardness, depending on species. In Mexico, the guava agua fresca beverage is popular. The entire fruit is a key ingredient in punch, and the juice is often used in culinary sauces (hot or cold), as well as artisan candies, dried snacks, fruit bars, desserts, or dipped in chamoy. Pulque de guava is a popular blend of the native alcoholic beverage. In many countries, guava is eaten raw, typically cut into quarters or eaten like an apple, whereas in other countries it is eaten with a pinch of salt and pepper, cayenne powder or a mix of spices (masala). It is known as the winter national fruit of Pakistan. In the Philippines, ripe guava is used in cooking sinigang. Guava is a popular snack in Taiwan, sold on many street corners and night markets during hot weather, accompanied by packets of dried plum powder mixed with sugar and salt for dipping. In east Asia, guava is commonly eaten with sweet and sour dried plum powder mixtures. Guava juice is popular in many countries. The fruit is also often prepared in fruit salads. Because of its high level of pectin, guavas are extensively used to make candies, preserves, jellies, jams, and marmalades (such as Brazilian goiabada and Colombian and Venezuelan bocadillo), and also for juices and aguas frescas or may be used in a marmalade jam on toast. Red guavas can be used as the base of salted products such as sauces, substituting for tomatoes, especially to minimize acidity. A drink may be made from an infusion of guava fruits and leaves, which in Brazil is called chá-de-goiabeira, i.e., "tea" of guava tree leaves, considered medicinal. Ch. = Choline; Ca = Calcium; Fe = Iron; Mg = Magnesium; P = Phosphorus; K = Potassium; Na = Sodium; Zn = Zinc; Cu = Copper; Mn = Manganese; Se = Selenium; %DV = % daily value i.e. % of DRI (Dietary Reference Intake) Note: All nutrient values including protein and fiber are in %DV per 100 grams of the food item. Significant values are highlighted in light Gray color and bold letters. Cooking reduction = % Maximum typical reduction in nutrients due to boiling without draining for ovo-lacto-vegetables group Q = Quality of Protein in terms of completeness without adjusting for digestability. Guavas are rich in dietary fiber and vitamin C, with moderate levels of folic acid. Having a generally broad, low-calorie profile of essential nutrients, a single common guava (P. guajava) fruit contains about four times the amount of vitamin C as an orange. 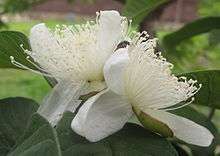 However, nutrient content varies across guava cultivars. Although the strawberry guava (P. littorale var. cattleianum) has only 25% of the amount found in more common varieties, its total vitamin C content in one serving (90 mg) still provides 100% of the Dietary Reference Intake. 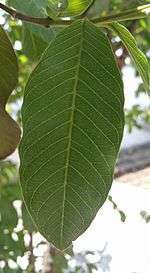 Guava leaves contain both carotenoids and polyphenols like (+)-gallocatechin and leucocyanidin. As some of these phytochemicals produce the fruit skin and flesh color, guavas that are red-orange tend to have more polyphenol and carotenoid content than yellow-green ones. Possibly used for culinary or cosmetics products, guava seed oil is a source of beta carotene, vitamin A, vitamin C, copper, zinc and selenium. The composition of fatty acids in guava seed oil is presented in the following table, showing that the oil is particularly rich in linoleic acid. Since the 1950s, guavas – particularly the leaves – have been studied for their constituents, potential biological properties and history in folk medicine. ↑ "Cambridge Advanced Learner's Dictionary & Thesaurus". Cambridge University Press. Retrieved 20 August 2012. ↑ Judd, WS; Campbell, CS; Kellogg, EA; Stevens, PF; Donoghue, MJ (2002). Plant systematics, a phylogenetic approach. Sinauer Associates, Inc. pp. 398–399. ISBN 0878934030. 1 2 3 4 5 6 7 8 9 Morton JF (1987). "Guava, in Fruits of Warm Climates, p 356-63". Center for New Crops & Plant Products, Department of Horticulture and Landscape Architecture, Purdue University, West Lafayette, Indiana. Retrieved 24 April 2015. ↑ Sauls JW (December 1998). "Home fruit production – Guava". Texas A&M Horticulture Program. Retrieved 2012-04-17. ↑ Boning, Charles R. (2006). Florida's Best Fruiting Plants: Native and Exotic Trees, Shrubs, and Vines. Sarasota, Florida: Pineapple Press, Inc. p. 99. ISBN 1-56164-372-6. ↑ Price J (14 June 2008). "Strawberry guava's hold has proven devastating". Honolulu Star Bulletin. Retrieved 7 December 2014. ↑ "Leveling the Playing Field in Hawai'i's Native Forests" (PDF). Conservation Council for Hawai‘i. 2010. Retrieved 7 December 2014. ↑ "National Nutrient Database for Standard Reference Release 28". United States Department of Agriculture: Agricultural Research Service. ↑ "Nutrition facts, calories in food, labels, nutritional information and analysis". NutritionData.com. ↑ "USDA Table of Nutrient Retention Factors, Release 6" (PDF). USDA. USDA. Dec 2007. 1 2 "Nutritional Effects of Food Processing". NutritionData.com. ↑ Nutritiondata.com. "Nutrition facts for common guava". Retrieved August 17, 2010. ↑ Nutritiondata.com. "Nutrition facts for strawberry guava". Retrieved August 17, 2010.